With the National Week of Making behind us, you might be ready to start a makerspace in your school — but not know where to start. Will purchasing a costly 3D printer and the latest robotics kit ensure learning and maker success? What are some steps to starting a successful makerspace from scratch? Before you can build your own community of makers, you need to join one! 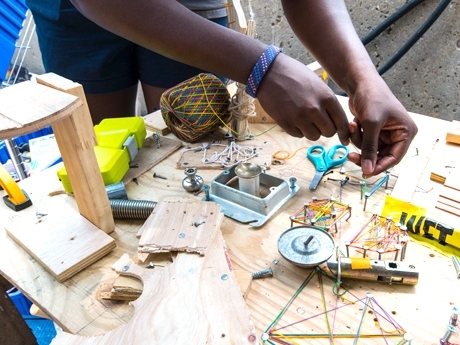 Immerse yourself in makerspaces by joining a summer maker camp like Exploratorium’s Tinkering Fundamentals or the virtual Camp Google for cheap and easy STEM ideas, but most importantly: make stuff! Go to the public library or a community makerspace and learn Arduino, coding, etc. Some easy ways into coding are the Hour of Code and Scratch programming. Institute a family maker time at home and make low-tech, STEM-related crafts with little ones, like this balloon-propelled car or this balloon hovercraft.